I’m pretty sure I’m not alone in the opinion that The Indigo Spell, with its 400 pages, is far too short. I finished it in a single afternoon and then I just sat there for a while, hoping it would grow a few (hundred) extra pages but sadly, I don’t share Sydney’s magical abilities. Not a single page grew and I had to let it go... for now. "You're not as much of a lost cause as she was. I mean, with her, I had to overcome her deep, epic love with a Russian warlord. You and I just have to overcome hundreds of years' worth of deeply ingrained prejudice and taboo between our two races. Easy." I didn’t think there was any hope whatsoever for me and Sydney, but her behavior and courage in this book endeared her to me after all. She is a far cry from the judgmental, prejudiced girl from Blood Promise and Bloodlines. She finally learned to stand up for herself and do her own thinking. It’s not easy to break a lifetime of rigorous conditioning, and watching Sydney open her eyes and see the Alchemists in a whole new light was a wondrous and unforgettable experience. My hat’s off to Mead (I’m actually wearing a hat right now, you know) for turning this unlikely heroine into someone I can root for and admire. So who is Marcus Finch? A disappointment, really. He didn’t bring much to the story, but I suppose he served his purpose. I was ecstatic when I realized that Mead won’t torture us with another love triangle after all. I don’t think I could have kept reading if that was the case. But Sydney was never even remotely interested in Marcus, and it made me admire her even more. 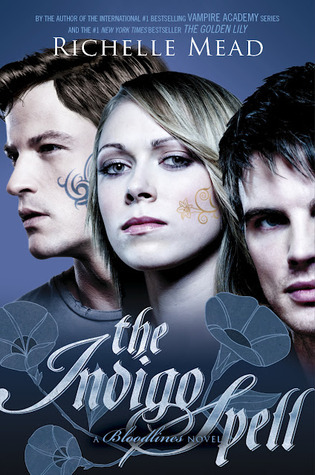 The Indigo Spell focused mostly on Sydney’s magic, her doubts about the Alchemists and her relationship with Adrian (yaay!). Jill, Eddie and Angeline were present, but they didn’t play a big role this time and I kind of liked it that way. Both Jill and Angeline can be pretty tiresome and as soon as the story turns to them, it becomes infinitely more childish. I’m perfectly happy with them remaining in the background. Mead promised us the most powerful scene she’s ever written in The Fiery Heart and she compared it to Shadow Kiss, which of course left me terrified for Sydney and Adrian. I think I won’t sleep well until November. The word re-education is mentioned in the synopsis and it was more than enough to send chills up my spine. What do you think will happen? Are you as terrified as I am? I think it’s clear that I’m very happy with the direction this series is taking, as long as no one becomes a Strigoi or a mindless drone in the hands of the Alchemists. Given the choice, I think I’d prefer a Strigoi – Dimtri was hot even when he was dead. Btw, am I the only one who desperately wanted fondue when I finished reading this book? The swoon factor was HIGH in this book and I loved it! I agree, the book felt like a much shorter story, it was so quick to read. And I think Sydney has really grown, too. She's much stronger and I was so happy at the end until that last bit, poor Sydney! This was definitely a swoon worthy read! So glad that you've grown to like Sydney, I know a lot of people initially found it hard to get on with her. *nods* I'm scared and excited for the next book, so glad it's coming out this year, not next! Darn! I hate when the magical book-expander powers fail. Sidney sounds fantastic -- I actually appreciate a character who makes me work to like her (as long as she endears herself to me in the end!). I loved VA I really need to read this spin off as well. I love Adrian but I have heard so much about Sydney and her not greatness that it makes me nervous! I'm not reading this because I have all the books in this series and do plan to read them soon but I still wanted to leave some comment love. I'm happy to see that this one got 4 stars and is continuing to be a great series for you, that makes me want to get started on it soon! This makes me happy... and also a little relieved! I hated the first book (which came as a shock as I didn't think I could ever hate anything written by Mead), but between you and Wendy, I'm convinced that I'll be rewarded for giving this series another try. I'll have to dig out my copy of Golden Lily soon. Great review, Maja! ACK! I tried the first book on audio, but the audio was screwed up. What I did get to listen to did capture me and I can see what you mean about her being judgmental. Oh and you have me worried about reeducation. I know enough to know that isn't good. Eek! I haven't read the first and I'm worried. Yep, need to start this series in earnest! And I also soooo agree with you about Jill and Angeline. Less of them, please. Let's swap their page time for more magic, and WAY more Adrian. I have got to read this one soon. I have always been a fan of Sydney in this series, I like that she is so level headed an uptight and nerdy and I am loving watching her grow. I hear ya, I have always been firmly in Dimitri's camp but Adrian is winning me over. Gosh I love fondue! Brilliantly reviewed! I've seen so many positive reviews about this series that I've always been reluctant to read this series after VA! I mean I LOVED Vampire Academy, I would say its my favourite vampire genre series! (I know, on top of twilight! :O) :P Like Heidi said I will always be on team Dimitri, I mean who wouldn't be, but their is something niggerling at me with Adrian's character! Great review, Maja! LOL - I love the 1st paragraph. Rarely do books make me feel that way, but it's awesome when they do! I still need to start this series. Hell, I still need to read the VA! I will one day! Great review. I may give it a try since I have the first book. I read the first VA book but never got a chance to continue the series. So I need to get on that before I start this one. It seems like everyone loves them though! I've not read any of these yet. They sound like great reads. Thank you for sharing about this one. I absolutely loved this book. How could you not? I'm dying to see where the next book goes after the big twist on the last page.